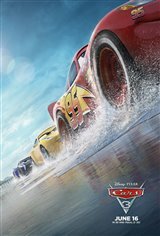 In the follow-up to Cars (2006) and Cars 2 (2011), legendary Lightning McQueen (Owen Wilson) suffers a devastating accident mid-race. Retirement seems imminent and his glory days seem long gone. But he's determined to reenter the pack of competitors and find his way back to the race track. To do so, he has to rely on the expertise of young technician Cruz Ramirez (Cristela Alonzo) and a dose of inspiration from the late Fabulous Hudson Hornet.